The Squamous Suture is a simple joint that unites the parietal and temporal bones of the skull. It is among several sutures which are a type of stationary joint that is found only among cranial bones. These sutures are fibrous joints are made up of a thin layer of dense fibrous connective tissues. The irregular interconnecting edges of the bones attached via these sutures. They increase the overall strength of the joints as well as decrease the risk of fracture as a result of impacts or other probable injury. The squamosal suture connects the temporal squama together with the lower boundary of the parietal and arches posteriorly from the pterion. This suture is constant posteriorly with the short, nearly horizontal parietomastoid suture that merges the mastoid process of the temporal with the mastoid angle of the parietal. 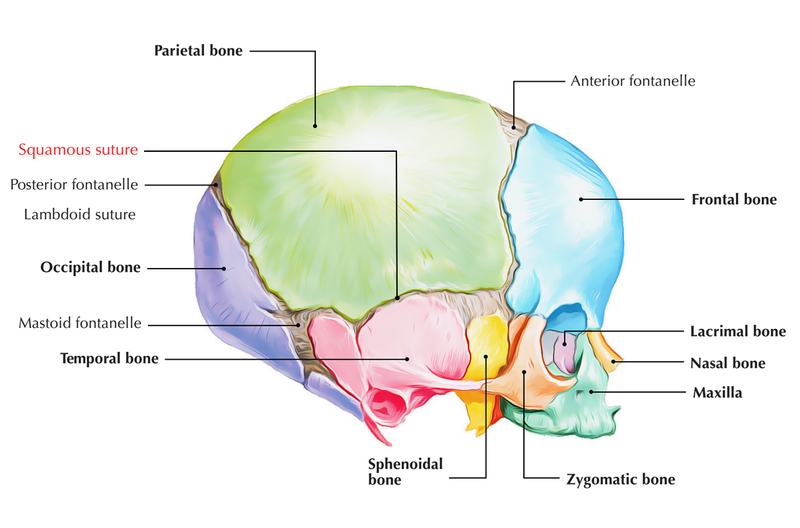 Growth at the squamous suture enhances the vertical height of the cranium at the time skeletal maturation Along with growth of the pterion, the asterion as well as at the frontozygomatic suture.